Whether DYFS IN NJ,to ORANGE COUNTY DSS,to California,Texas and all states,counties throughout U.S.A. such time to sue is limited. It all begins with PROPER-TIMELY notice of your intent to sue and a ongoing,continual help around the clock,to ensure your suit is being handled by YOU, the pro-se litigant EFFECTIVELY.When lawyer do not care? Simply begin by filling out help form below, for your 1-on-1 POWER SESSION, with the founder E-Staff today. 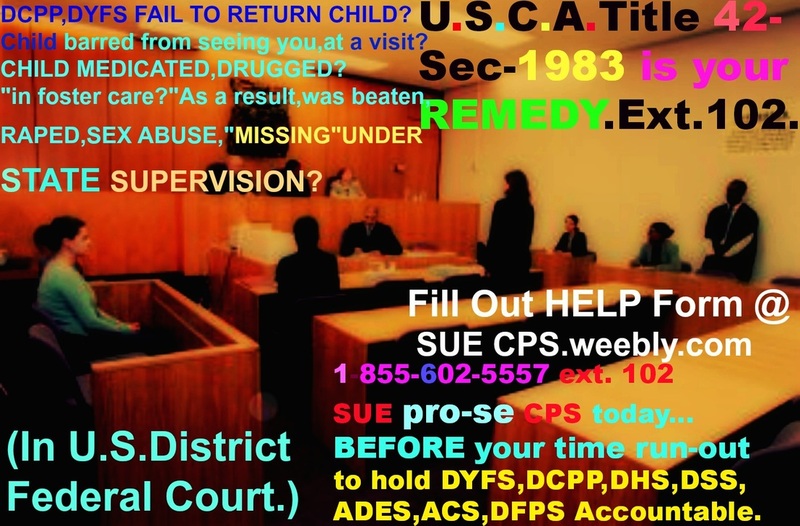 Fill out contact/help page to begin same-day and we wish you all the best of luck when suing pro-se cps,by deadline pro-se.